Baseball movie A League of Their Own turns 20 with this Blu-ray, a 20th Anniversary Edition release. Remember this movie? If not, A League of Their Own stars Tom Hanks (Road to Perdition) as a down-and-pretty-much-out baseball player who has taken to the bottle while the world is battling WWII. With the men’s professional baseball league on hold, Hanks takes a job coaching a team in the first professional women’s league, which is set up to basically give some entertainment and keep morale up during the war. No one told the women players, though. 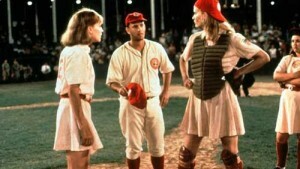 Led by Geena Davis (Thelma & Louise) and her sister Lori Petty (Point Break), the women approach baseball with a vengeance. Madonna and Rosie O’Donnell also star as baseball players, and the cast also includes Jon Lovitz (TV’s Hot in Cleveland), David Strathairn (TV’s Alphas) and Bill Pullman (Too Big To Fail). Rated PG, A League of Their Own grossed a tidy $107 million when it was in theaters in 1992, and we’re glad to see it finally on Blu-ray.